There’s a company that makes shoes for energy healers, and those who are interested in “Earthing,” or connecting energy with the earth for all of the health benefits that come with it. Earthing is real, it’s also called grounding, and I incorporate it into my practice daily. There are many ways to get reacquainted with that people-Earth connection. One way is through a little visualization, thinking of yourself as a tree with roots growing down from your soles into the earth, then visualizing absorbing that healing earth-frequency into those roots and up into your body. (Soul to sole…hmm!) Try it. It doesn’t take long, it helps clear out negative energy from our systems, releases free radicals, and also clears the mind. Make sure to breathe while doing this exercise. Another way to stay connected with our home planet (which, by the way, is like a powerful magnet for balancing our systems), is to stroll around barefoot. I love doing that in the summer, but now things are getting rather cool and wet for an outdoor barefoot walk through the yard. 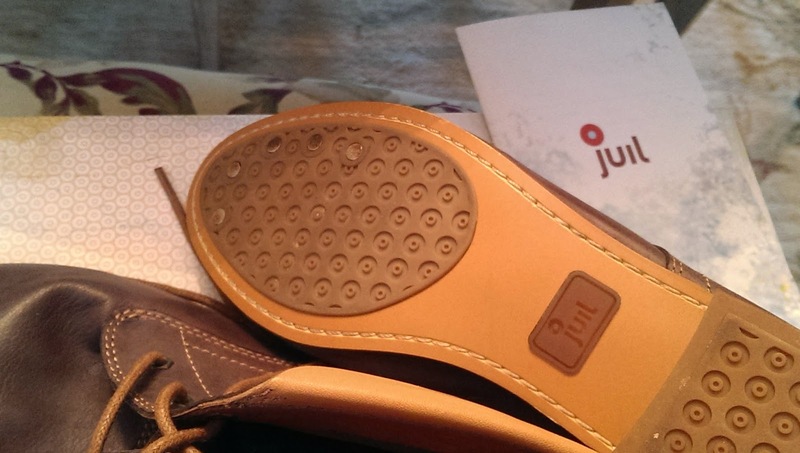 Back in 2012, I had the honor of reviewing some really beautiful sandals made for grounding by Juil, the company I mentioned who is directly addressing the health benefits of grounding with their shoe designs. They graciously sent me a pair of really high quality sandals (I still have them! My daughter has taken them and wore them every day throughout the spring and summer, and early Fall. That’s what I get for letting her borrow them once – ha.) The shoes help with grounding via a series of copper “dots” embedded in the sole of the shoe which act as conductors for the earth-foot connection. Makes sense – that’s exactly how we ground our houses – via copper. 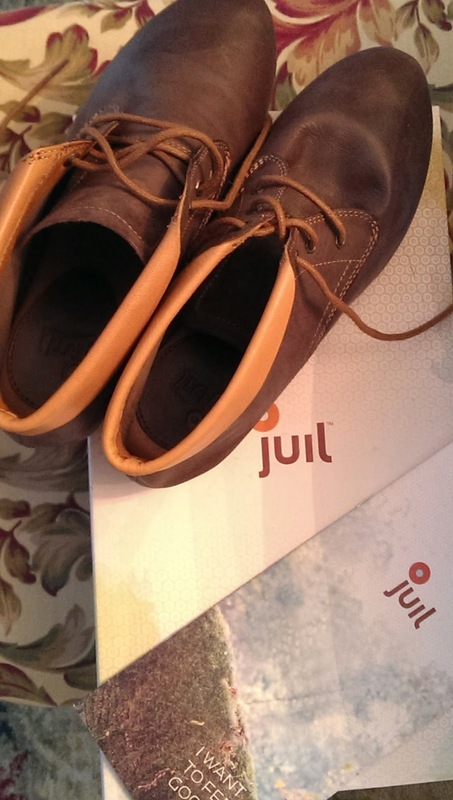 Well, Juil recently contacted me again and said they’ve made some shoes for Fall, and asked if I’d like to test a pair. That was an easy question! Of course! Excitedly, I opened the box with a new pair of shoes inside. The first thing I noticed is the feel of the leather. It’s the softest leather I’ve ever touched, let alone wore. I can hardly tell I’m wearing shoes because they’re so comfy. The quality is exceptional. As someone who has often bought shoes at major discount shoe stores, this was a new experience for me. What can I say? There’s a difference. There are actually wooden heels attached beneath the slip-proof rubber sole. Then, there are those copper dots. Here’s a picture of the shoes after I’ve worn them a few times. See the dots? They go through the sole to the inside. I was wondering if one could still receive the benefits of grounding through socks. So I checked the website. Apparently, I’m not the only one to ask that question, because it’s covered in their FAQ section. The answer is that our feet naturally perspire, and the moisture helps the copper continue to conduct the earth energy for our feet. Right! Water is also a conductor. Somewhere in the back of my mind’s science education, I remember that one. I applaud Juil for caring about our earth connection. I also appreciate they use natural vegetable based dyes instead of nasty chemicals. The free shipping is a good deal too. They’re nicely packaged in a thick, drawer-like shoe box, too, which makes a great “upcycle” item for little toys, CDs, whatever needs some storage. Check out their shoes. They have lots of new designs, and they’re totally worth trying. As I mentioned, I did receive a free pair to test, and my opinions are entirely my own. No other compensation was received for my opinion. However, I was impressed enough to become an affiliate. Maybe you will be too, when you try their shoes! Order yourself a pair here! Do you do grounding as part of your day? Have you read the book “Earthing” or any similar manuals?